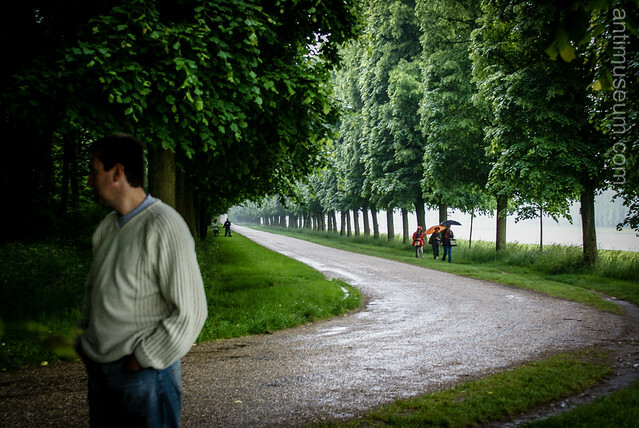 I took this picture 5 years ago on a humid May day on which we were organising a picnic in the park of the Chateau in Versailles. Although taken in low-light condition with my first Sony alpha 100 DSLR camera, I like its composition and the atmosphere due to the heavy rainfall and the extremely interesting hue and depth of the yellow light through the clouds and rain. The characters on the right are proving my point. We were sheltered by beautiful chestnut trees in the park and I was able to shoot his picture without being drenched.